Orsanmichele (Italian pronunciation: [orsamːiˈkɛːle]) (or "Kitchen Garden of St. Michael", from the contraction in Tuscan dialect of the Italian word orto) is a church in the Italian city of Florence. The building was constructed on the site of the kitchen garden of the monastery of San Michele, which no longer exists. Located on the Via Calzaiuoli in Florence, the church was originally built as a grain market in 1337 by Francesco Talenti, Neri di Fioravante, and Benci di Cione. Between 1380 and 1404, it was converted into a church used as the chapel of Florence's powerful craft and trade guilds. On the ground floor of the square building are the 13th-century arches that originally formed the loggia of the grain market. The second floor was devoted to offices, while the third housed one of the city's municipal grain storehouses, maintained to withstand famine or siege. Late in the 14th century, the guilds were charged by the city to commission statues of their patron saints to embellish the facades of the church. The sculptures seen today are copies, the originals having been removed to museums (see below). Inside the church is Andrea Orcagna's bejeweled Gothic Tabernacle (1355-59) encasing a repainting by Bernardo Daddi's of an older icon of the 'Madonna and Child'. The facades held 14 architecturally designed external niches, which were filled from 1399 to around 1430. The three richest guilds opted to make their figures in the far more costly bronze, which cost approximately ten times the amount of the stone figures. Orsanmichele's statuary is a relic of the fierce devotion and pride of Florentine trades, and a reminder that great art often arises out of a competitive climate. Each trade hoped to outdo the other in commissioning original, groundbreaking sculptures for public display on Florence's most important street, and the artists hired and materials used (especially bronze) indicate the importance that was placed on this site. Today, all of the original sculptures have been removed and replaced with modern duplicates to protect them from the elements and vandalism. The originals mainly reside in the museum of Orsanmichele, which occupies the upper floor of the church, and can be seen on every Monday, the only day when the museum is open. Two works by Donatello are in other Florentine museums: St. George and its niche are in the Bargello, and St. Louis of Toulouse is in the museum of the Basilica di Santa Croce. ^ a b c Zucconi, Guido (1995). Florence: An Architectural Guide. San Giovanni Lupatoto, Vr, Italy: Arsenale Editrice srl. ISBN 88-7743-147-4. ^ "The Orsanmichele Market in Time of Famine". The National Gallery of Art. Archived from the original on August 21, 2006. Retrieved July 14, 2006. ^ "Nanni Di Banco". The National Gallery of Art. Archived from the original on August 21, 2006. Retrieved July 14, 2006. ^ Sullivan, Mary Ann (July 10, 2005). 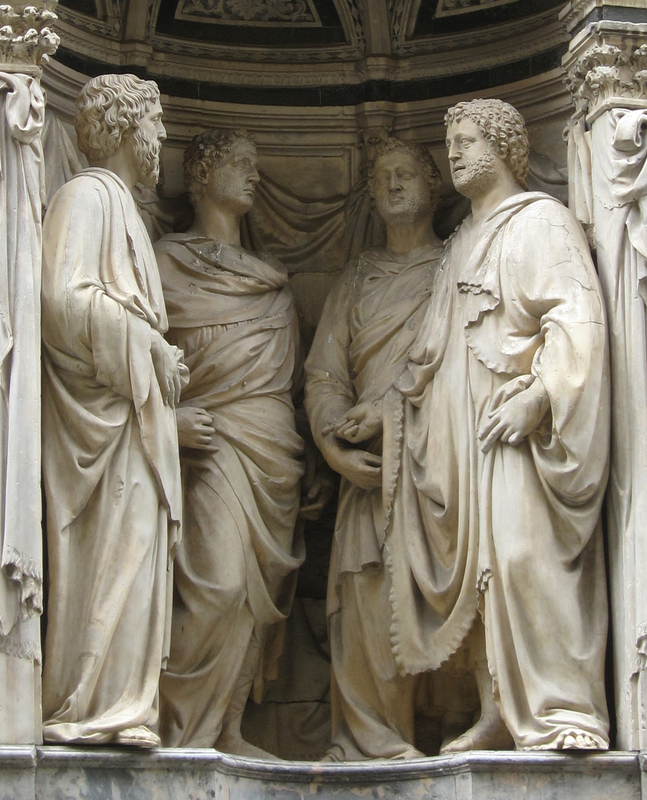 "Four Crowned Saints (or Four Crowned Martyrs) and relief at base of tabernacle, Orsanmichele". Orsanmichele. Digital Imaging Project: Art historical images of European and North American architecture and sculpture from classical Greek to Post-modern. Retrieved July 14, 2006. ^ Kren, Emil; Marx, Daniel (June 22, 2006). "St Mark". Web Gallery of Art. Retrieved July 14, 2006. ^ Sullivan, Mary Ann (July 10, 2005). "St. Philip, Orsanmichele". Orsanmichele. Digital Imaging Project: Art historical images of European and North American architecture and sculpture from classical Greek to Post-modern. Retrieved July 14, 2006. ^ "St. Philip" (JPG). Retrieved July 14, 2006. ^ Sullivan, Mary Ann (July 10, 2005). "Christ and St. Thomas (or Doubting of Thomas), Orsanmichele". Orsanmichele. Digital Imaging Project: Art historical images of European and North American architecture and sculpture from classical Greek to Post-modern. Retrieved July 14, 2006. ^ "Verrocchio". The National Gallery of Art. Archived from the original on August 21, 2006. Retrieved July 14, 2006. ^ Kren, Emil; Marx, Daniel (June 22, 2006). "St Louis". Web Gallery of Art. Retrieved July 14, 2006. ^ Sullivan, Mary Ann (July 10, 2005). "St. John the Baptist". Orsanmichele. Digital Imaging Project: Art historical images of European and North American architecture and sculpture from classical Greek to Post-modern. Retrieved July 14, 2006. ^ Sullivan, Mary Ann (July 10, 2005). "St. George (bronze copy of the original marble) and relief at the base of the tabernacle, Orsanmichele". Orsanmichele. Digital Imaging Project: Art historical images of European and North American architecture and sculpture from classical Greek to Post-modern. Retrieved July 14, 2006. ^ Kren, Emil; Marx, Daniel (June 22, 2006). "St George". Web Gallery of Art. Retrieved July 14, 2006. 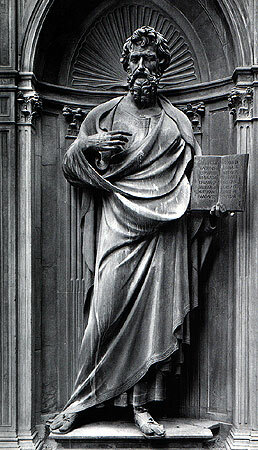 ^ "St. Matthew" (JPG). Retrieved July 14, 2006. ^ "Ghiberti". The National Gallery of Art. Archived from the original on August 21, 2006. Retrieved July 14, 2006. ^ "St. Stephen" (JPG). Retrieved July 14, 2006. ^ Sullivan, Mary Ann (July 10, 2005). "St. Luke". Orsanmichele. Digital Imaging Project: Art historical images of European and North American architecture and sculpture from classical Greek to Post-modern. Retrieved July 14, 2006. ^ "Orsanmichele". Foundation For Italian Art and Culture. November 9, 2005. Retrieved July 14, 2006. Orsanmichele, Smarthistory "Orsanmichele". Smarthistory at Khan Academy. Retrieved May 9, 2013. Campbell. 2011. Italian Renaissance art. Farnborough: Thames & Hudson Ltd.
Wikimedia Commons has media related to Orsanmichele. Sullivan, Mary Ann (July 10, 2005). "Orsanmichele". Digital Imaging Project: Art historical images of European and North American architecture and sculpture from classical Greek to Post-modern. Retrieved July 14, 2006. "Orsanmichele". Florence Art Guide. Retrieved July 14, 2006. "Monumental Sculpture from Renaissance Florence". The National Gallery of Art. Archived from the original on July 13, 2006. Retrieved July 14, 2006.